I've seen MLS loads over the years - they were as great as always (but just the lead singer now backed by session musicians). But Sleeper were a revelation. Louise W is a musical goddess! Amazing woman. She wrote nearly all the songs (words and music), plays guitar, and has a lovely singing voice. I've never seen a singer so humbled at a live show before. She couldn't believe the reception her songs were getting, and never stopped beaming and thanking us. I was going to this, but had to sell My ticket for this years Glastonbury (I got the last minute resale). Sleeper I love. Had The IT girl,Smart and Pleased to me you. Saw them twice in the '90s. Once supporting blur and in their own right at the Astoria II in 1995! great little band. I won a competition on face book last week and won these buttons(https://twitter.com/Markbastin72/status ... 0828788736" onclick="window.open(this.href);return false;) ! !well chuffed! 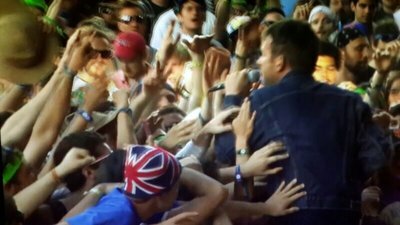 Hoping they do an addtional date to the 2nd of december gig , As I'm off to see the gorillaz on that date and would so love to see them again for old times sake! Neal Zeal wrote: But Sleeper were a revelation. Louise W is a musical goddess! Amazing woman. I am glad that Louise Wener (& Sleeper) are getting some accolades now. People who enjoyed music in that period will remember them fondly. They were good live IIRC and ticket stubs remind me that I saw them at least twice, at Newcastle University, Students Union in 1995 and at Middlesbrough Town Hall in 1996 with Mansun as support. Sleeper have a new single out. BBC 6Music giving it airplay. I must say though, I find the song a bit routine. I wasn't super impressed by the new single either. However, I am still planning on seeing them at the O2 Forum Kentish Town! Anyone else? A likeable band, and glad that they are doing good live shows.